Prime Power’s deluxe range of Honda powered generator units provide all the features that are wanted in a portable power unit. These portable power units are built using genuine Honda engines with long range fuel tanks, full control panels with a volt meter, 12V battery charging, power outlets and a fuel saving automatic idle (on HO5000 upwards) making these type of units sought after by both tradesman and home owners alike. On HO5000+ models, the fuel saving automatic idle function reduces engine speed to an idle when there is no load (or current draw) on the unit, which automatically increases the engine speed when a load is introduced. This technology not only saves fuel but also produces less engine wear and reduces overall noise of the unit compared to regular generators. The above table should be used as a guide only. Product specifications vary from manufacturer to manufacturer. 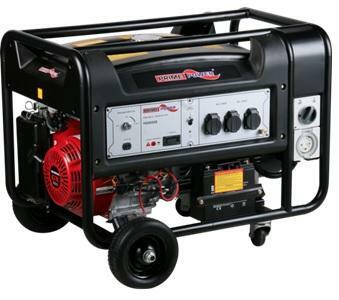 Other generators available on request. Please contact Blackmores Power & Water on 8663 2284 for more information. *Drills and small saws must be brush type motors with no excess starting load, all other electric motors see your dealer for advice. Electronic welders often take more power to correctly operate. Check with your welder manufacturer for their recommendation with this type of product. Both Blackmores Power & Water and Prime Power accept no responsibility for generators chosen purely using this basic guide. At all times you must refer to manufactuer of the product to be operated by the generator for the correcting sizing of machines.